Perennial. Culms decumbent; 30-60 cm long; rooting from lower nodes. Leaf-sheaths pilose; with tubercle-based hairs. Ligule a ciliate membrane. Leaf-blades lanceolate; 10-15 cm long; 14-17 mm wide. Leaf-blade surface pubescent; hairy abaxially. Inflorescence a panicle. Panicle open; oblong; 10-16 cm long; contracted about secondary branches. Spikelets solitary. Fertile spikelets pedicelled. Spikelets comprising 1 basal sterile florets; 1 fertile florets; without rhachilla extension. Spikelets oblong; dorsally compressed; subacute; 1.5-1.75 mm long; falling entire. Glumes dissimilar; reaching apex of florets; thinner than fertile lemma. Lower glume ovate; 0.2 length of spikelet; membranous; without keels; 0 -veined. Lower glume lateral veins absent. Lower glume apex acute. 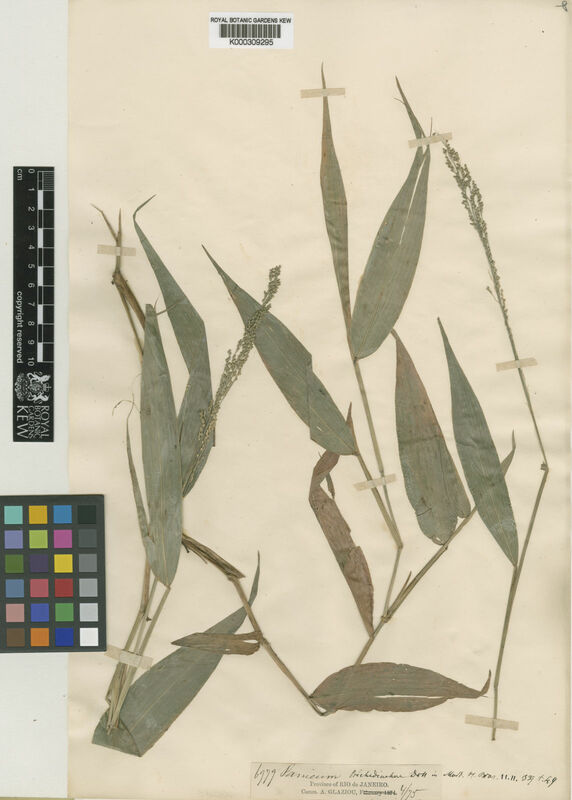 Upper glume oblong; 1 length of spikelet; membranous; without keels; 5 -veined. Upper glume apex obtuse. Basal sterile florets male; with palea. Lemma of lower sterile floret similar to upper glume; oblong; 1 length of spikelet; membranous; 5 -veined; obtuse. Fertile lemma elliptic; dorsally compressed; 1.5 mm long; indurate; pallid; without keel. Lemma surface pubescent; hairy all along. Lemma margins involute. Lemma apex obtuse. Palea involute; indurate. Palea surface pubescent. Argentina Northeast, Belize, Brazil South, Brazil Southeast, Colombia, Costa Rica, Dominican Republic, Ecuador, El Salvador, Guatemala, Haiti, Honduras, Mexico Central, Mexico Gulf, Mexico Northeast, Mexico Southeast, Mexico Southwest, Nicaragua, Panamá, Paraguay, Puerto Rico, Venezuela, Windward Is.